Computex will officially starting tomorrow on June 5 but Acer has already kicked things off with a whole slew of Windows 8 based products. First of all are the two Acer Aspire S7 Ultrabooks. Available in two sizes, 13.3-inch and 11.6-inch, these are the thinnest and smallest, respectively, Full HD touch Ultrabooks in the world. Both models feature an aluminum unibody design but the 13.3-inch model also uses a glass top. The 13.3-inch model also has a display that tilts all the way back so you can use the touchscreen more comfortably. As far as connectivity goes, the 11.6-inch model has a Thunderbolt port, a single USB 3.0 port, micro HDMI out and a microSD card slot. The 13.3-inch model adds an extra USB 3.0 port on the side and has a full SD card slot instead. Both models also have backlit keyboards. Regarding the battery life, Acer claims the 13.3-inch model runs for up to 12 hours whereas the 11.6-inch model runs for around 9 hours, giving you almost an entire day of usage from a single charge. Moving on, we have two Acer Iconia tablets running on Windows 8. First is the W510 with the 10.1-inch FullHD display. 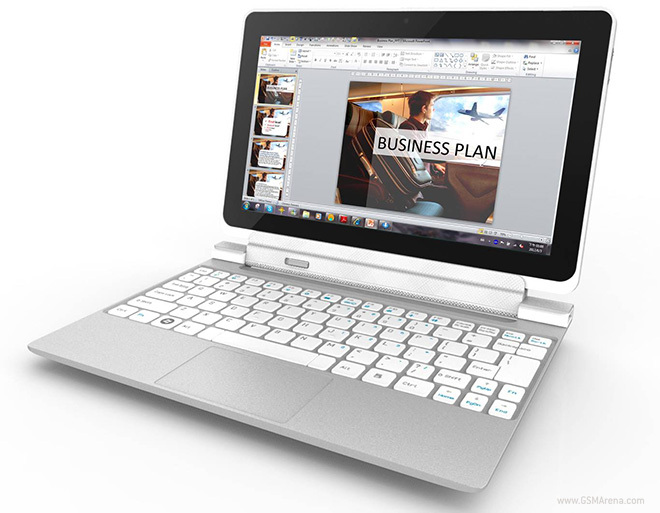 It comes with a keyboard dock, à la the ASUS Transformer Prime, onto which you can dock the tablet. The keyboard dock also has a unique feature where you can tilt the tablet back 295 degress, which puts the keyboard face down and turn it into a stand for the tablet. Like the keyboard dock for the Transformer Prime, the keyboard dock for W510 also extends the battery life to up to a claimed 18 hours. The keyboard dock also adds a single USB port. The tablet itself has a microHDMI, microUSB, microSD card slot, SIM card slot and stereo speakers on the side. There is also an 8 megapixel camera with flash on the back and front facing camera and the prerequisite Windows keys on the front. The next is the Iconia W700 tablet. It has a 11-6-inch FullHD display. It does not have a keyboard dock but comes with a multi-purpose cradle that allows you to place the tablet in landscape and portrait mode. It also has not one or two but three USB 3.0 ports on the back. The W700 tablet itself also has a full USB 3.0 port, along with a microHDMI and Thunderbolt port, which makes it a much more serious machine than the W510 tablet we saw before. It also has a 5 megapixel camera on the back and Dolby Home Theater. 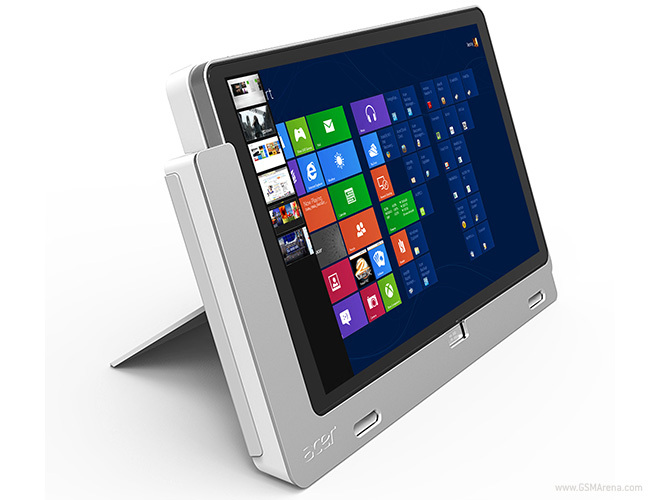 Lastly, there are two Windows 8 All-In-Ones with FullHD touchscreen displays, the 27-inch Aspire 7600U and 23-inch Aspire 5600U. The 7600U supports 64-point (!) multi-touch display. You can tilt it all the way back till it lies flat with the surface and you can also tilt it into portrait mode to make what Acer calls the world’s biggest e-book reader. 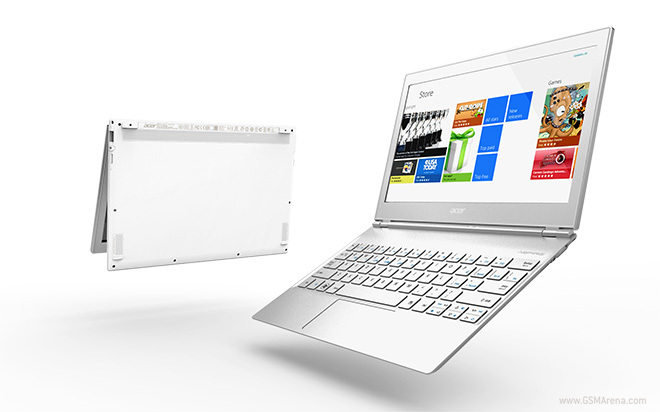 The 5600U has slightly limited tilting angles but according to Acer is the world’s thinnest AIO. You may have noticed a distinct lack of specs, prices and availability information in this post and that’s because none of these is available at the moment. With Windows 8 itself slated to launch sometime in October, it will be a while before you could get your hands on any of these. Meanwhile, you can watch some hands-on videos in the source link below.